Whatiffers should scroll down to the bottom of the post above, and you will see just what DCC is prepared to deliver to the 2GP hearing as rebuttal evidence against our submission. It appears that DCC don’t really care what they present. Just as long as it suits their story. You will find the heading “2GP Heading Topic Transportation”, scroll down further to “Statement tabled at hearing” : Sarah Connolly. 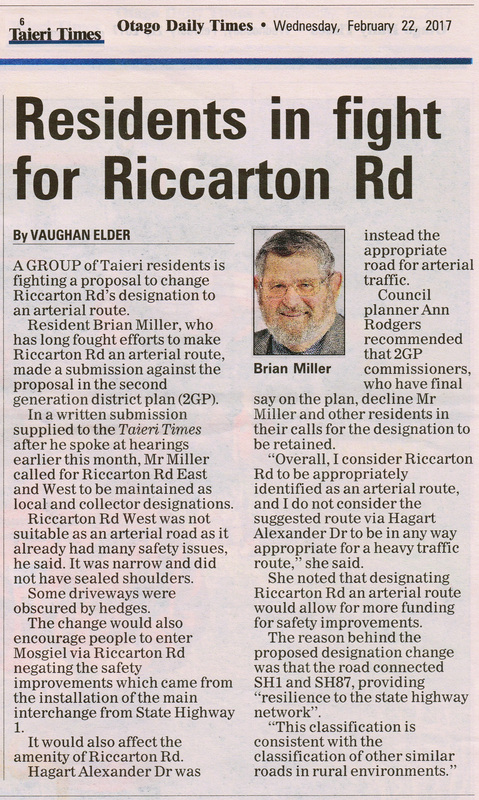 Having lived on Riccarton Rd for about thirty years I have yet to see any activity on widening the road, let alone the widening being “completed”. The readers of What if? can make their own judgement on the standard of council’s ‘advice received’ to the 2GP if this is an example of what they present. 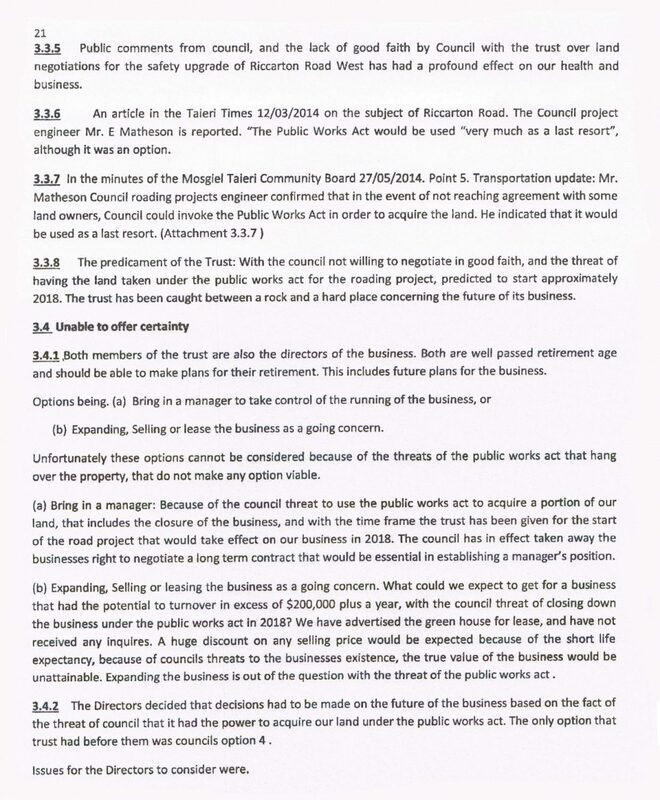 However……due to an ex councillor building so much down Hagart-Alexander it is not suitable now. In fact it’s a bloody mess just trying to drive a car down it never mind a truck. What a well researched and revealing document Mr Miller has presented to the new District Plan hearing. I would recommend to viewers to read the Miller trust submission. 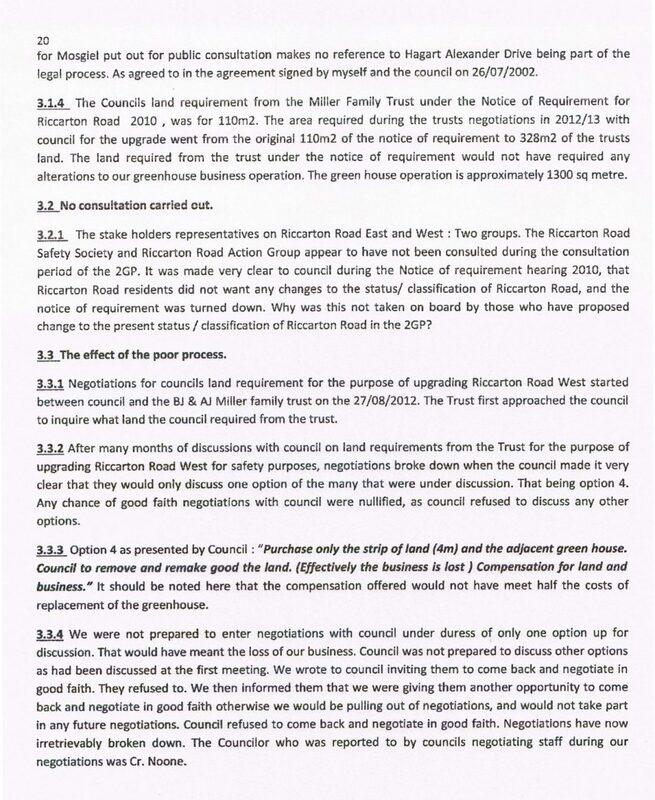 We should all be very concerned how the council has treated residents of Riccarton Rd, and especially the Millers in such an appalling way. It would appear that all is not well out in Mosgiel when it comes to transportation matters. 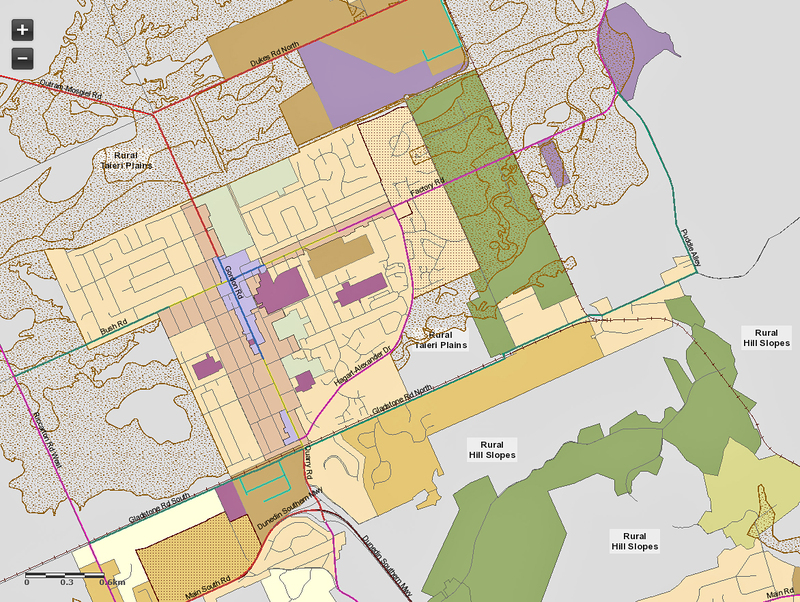 Transportation plans appear to have been developed to suit individuals, and one in particular rather than for the community. One only has to read the Miller submission (page 14) point 2.1.2. It would appear that the present developer when purchasing property in 1982, has signed a legal document for a proposed arterial road. That has now been developed as Hagart-Alexander Drive. It would appear that this route to a new industrial area to be developed, had been decided by agreement with other councils of the time. Well before amalgamation with the DCC. See points 2.1.13 through to point 2.1.17. 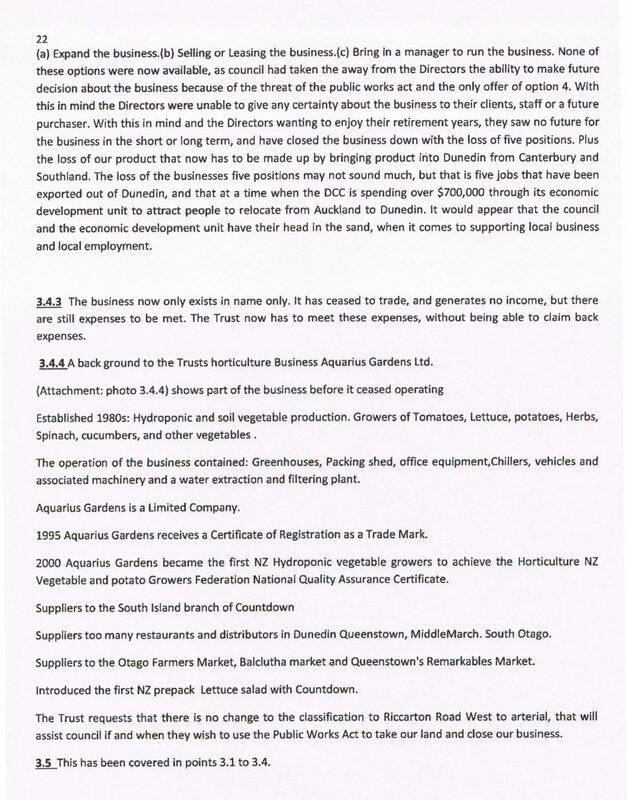 The structure plan for Mosgiel East and North of East A, signed and sealed in the Environment Court by the DCC and others, appears in part to have been completely ignored by the DCC, and could be in breach of the Environment Court ruling. It would appear that DCC has no intention of adhering to legal documents, and consider themselves to be above the law. I would encourage viewers to read the Miller Trust submission. 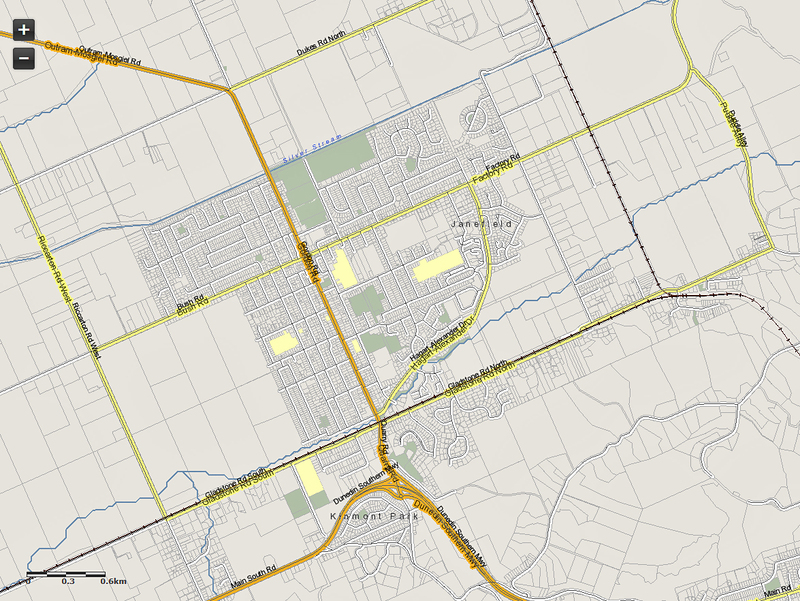 It may give you some insight of just who the new Mosgiel Transport section of the District plan is being designed for. It is certainly not for the community.